Originally a 5 bedroom, 3 bath home, this residence had a small inefficient bathing space masquerading as a master bath. Conscious Construction expanded the master bath into the adjacent bedroom to create a spacious bathroom and a large walk-in closet. 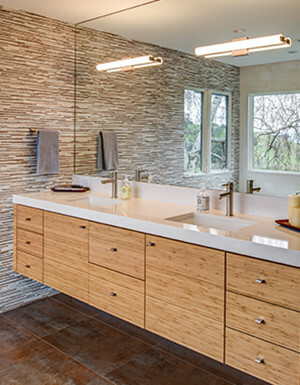 Bathroom details include: a custom bamboo vanity, Yukon Blanco Silestone countertop, Porcelanosa tile, Grohe fixtures, and custom frameless shower glass, all combining to create an elegant space. 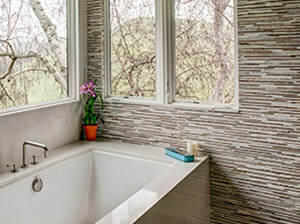 The additional two bathrooms were also remodeled with Porcelanosa tile, Caesarstone countertops, custom vanities and shower glass, for continuity of design throughout the home. Electric heating mats were installed under the tile to create a warm inviting space, even in the middle of winter!